The borough Treptow in Berlin on the 28th of January 2003. In a former omnibus depot in an industrial backwater something amazing is happening. 250 pupils from 25 nations are dancing to Stravinsky's 'Sacre du Printemps', which they have rehearsed for nearly three months, trained by the British choreographer Royston Maldoom and accompanied by the Berlin Philharmonic Orchestra under its chief conductor, Sir Simon Rattle. RHYTHM IS IT! follows the fascinating process leading to the Sacre performance, the most ambitious project in the Zukunft@BPhil program for the year 2003. 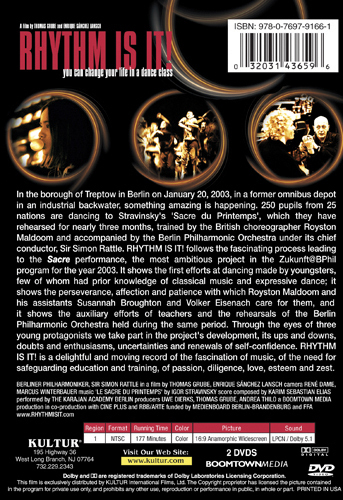 It shows the first efforts at dancing made by youngsters, few of whom had prior knowledge of classical music and expressive dance; it shows the perseverance, affection and patience with which Royston Maldoom and his assistants Susannah Broughton and Volker Eisenach care for them, and it shows the auxiliary efforts of teachers and the rehearsals of the Berlin Philharmonic Orchestra held during the same period. Through the eyes of three young protagonists we take part in the project's development, its ups and downs, doubts and enthusiasms, uncertainties and renewals of self-confidence. It is a fascinating journey into new, undreamed-of worlds and reveals surprising facets of the protagonists' personalities. Such was the task that Royston Maldoom undertook … with the help of fellow educators Susannah Broughton and Volker Eisenach–under the auspices of the Berlin Philharmonic’s arts-in-education program, Zukunft@BPhil. 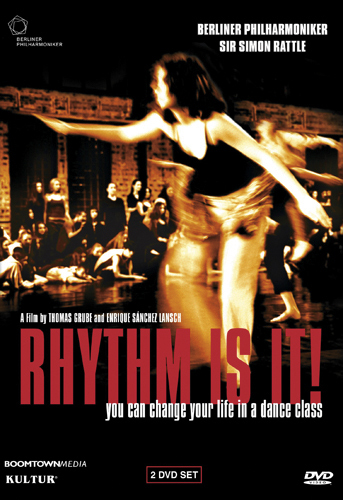 The inspirational documentary Rhythm Is It!, … newly released in the U.S. by Kultur … chronicles Maldoom’s dogged work with students from Berlin public schools and the individual journeys of those youngsters, many of whom come from disadvantaged backgrounds or troubled family situations.